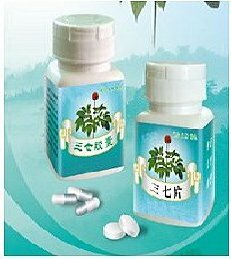 S	ince the early 20th century, TCM-cardiovascular health approach often uses the application of Panax Notoginseng. In recent years, experts from both home and abroad have made wide researches and experiments and gained a lot of achievements on it. They explored the application of Panax Notoginseng in the area of medicine, diet, and healthcare focusing in the following aspects: Stopping bleeding and improving hematopoiesis; Strengthening and improving coronary micro-circulation; Relieving pain; Anti-inflammation; Regulating immunity system to recover the high or low immunity reaction to normal standard; Anti-tumor; Anti-aging and anti-oxidizing; Decreasing blood fat and cholesterine; Protecting liver; Anti-fatigue, improving memory and learning capacity. Modern research found that, Panax Notogiinseng contains diversified active substances, including 24 kinds of panax notoginseng saponins, 17 kinds of amino-acids, 77 kinds of volatile oils, panax notoginseng polysaccharose, panax notoginseng flavone, all helpful ingredients for many body functions including healthy arteries and blood circulation. Decreased blood fat and cholesterol, protects the liver,improves memory and learning capabilities.